How many social media accounts does an advanced social business have? Well, when we look at mature companies like Microsoft, we find large indexes, or CPG giants like Coca-Cola each deploy their own, then even regionalize, or any large retail or hospitality brand that has regional stores with their own specific accounts like each hotel at Four Seasons with their own Twitter accounts. Altimeter’s continued research on the Social Media Management System (read all posts) space has found some interesting findings. In fact, our recent survey out to corporate marketers at large corporations yielded a surprising number of social media accounts. 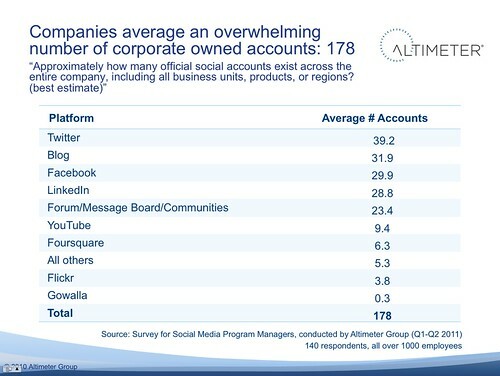 Above: Companies average an overwhelming number of corporate owned accounts: 178. Note: This does not include personal accounts that an employee would take with them if they left the company. The above data is a sample of the data we recently got back from the field on the growth from 140 global national corporations with over 1000 employees averaged. Large corporations have dozens to hundreds of products, and each can be regionalized spurring on the number of accounts, plus corporate level accounts, as well as campaign focused accounts created by agency partners. While 178 seems like a lot now, it’s only going to increase, what’s spurring this growth? This is an indicator that companies are shifting into hub and spoke and multiple hub and spoke, also known as “Dandelion“, which our research on maturity models indicate this a growing trend. Beyond the data, it’s just common sense as each business unit beyond corporate communications wants their own account. In fact the number of vendors continues to increase, just yesterday I added Webtrends, Targeted, and SproutSocial onto The List of Social Media Management Systems. While only about 30 vendors now, this will continue to grow, I expect the category set to reach 100 vendors just as I saw the same patterns with the community platform space, also a commodity marketplace. In fact, expect more software incumbents that help to manage communications (email, marketing auto, crm, analytics, customer support apps and beyond) to integrate these features by building or buying in rapid succession. In fact, the Financial Times just published a piece on the growth of this space, and cited our research on spending. So what does this mean for the Corporate Social Strategist, who we conduct research on frequently? This is an indicator that if they don’t have a strategy to safely manage growth they are going to head into the ever reactive sanitation role of social media helpdesk soon. What does the Helpdesk look like? It’s simple: they are constantly responding (but falling behind) on requests from stakeholders who want their own social accounts. If they don’t provide a strategy, the business units deploy it on their own. The end state? the strategist still has to clean this up or close down accounts –it never ends. Develop and Audit Process: Internal inventory and audit of all accounts, and a ‘certification’ program to ensure business units agree to the above item, then they are listed on the official index lists as sanctioned. Rollup Reporting: Provide enterprise wide reporting to executive heads by aggregating data from the disparate business units. Currently we (Brian Solis, Andrew Jones, Christine Tran, Zak Kirchner and myself) helping brands with vendor selection, and will be publishing a report on this topic, and are happy to provide additional data and analysts perspective to press and media.